[Returning from the Brink] So, there hasn't been a review of Steve's on the blog since 2015. While we do have 11 reviews here, I technically wrote just one of them and added a footnote to another because Nick's local selection was way better than the four flavors I could find around me. I say that because it's not that we wanted to stop reviewing Steve's, it's that they filed for bankruptcy in February 2017. They were scooped up by Dean Foods for a mere million bucks which seems like a steal but what do I know. (Remember that Dean Foods owns a bunch of ice cream brands including Friendly's). For whatever reason, they've switched from a solid plastic top to a mixed paper top with a plastic rim. I assume there is some reason for this but I have no idea what. Side note: I don't know if you collect ice cream containers, but I do sometimes. The catch is I only save plastic that I can wash, so for a pint like this, I would save the plastic pint body but would throw out the lid just to be safe. For the most part, the pints look pretty similar to their pre-bankruptcy design. 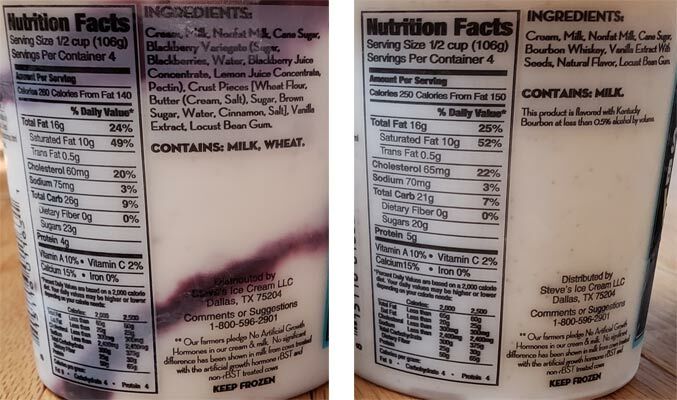 The most interesting change is that instead of saying "Crafted by Steve's Ice Cream, Brooklyn, NY" the pints now say "Distributed by Steve's Ice Cream LLC, Dallas TX" (you can see it below on the nutrition facts picture). 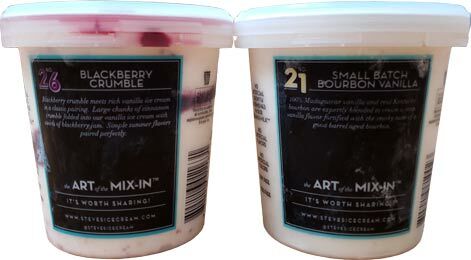 The saddest change is Dean Food's taking the time to trademark the old Steve's phrase "the ART of the MIX-IN". Oh well, I guess I feel justified for calling them mix-ins and not inclusions all these years hehehe. Oh wait, I should mention that according to their website, they currently have six regular flavors and five non-dairy flavors available (so if you haven't seen an old favorite yet, that might be why). The other four returning regular flavors are Brooklyn Blackout Cake, Southern Banana Pudding, Salty Caramel, and Whoopie Pies & Sweet Cream. Their dairy free (coconut based) flavors are chocolate salty caramel, burnt sugar vanilla, speculoos cookie butter, wildflower honey pistachio, and blueberry lemon ice box cake. These flavors are also egg free. All 11 flavors feature no artificial flavors. Ok, Time to finally try crumble myself and also finally review the vanilla. I take a small scoop of vanilla and think "that tastes like coconut", but that can't be right. I check the ingredients and remember "oh crud, this is bourbon vanilla". No way I can sample this right now, the bourbon component is too risky for the insides right now. Ok, let's try the blackberry crumble that Nick reviewed almost three years ago. Geez, my brain thinks it tastes a bit of cream cheese but that's not in the description. Overall, it's good. there's a ton of swirl and I want to spread it around so my bites don't taste like only jelly. No need to waste a good sweet liquidy swirl like that. Overall I definitely like it. The texture is a bit strange. I guess stiff is the best word to describe it. It's definitely different from B&J's or H-D. The crumble bits are more like dense cake bits than crunchy pie crumble. I think the density is helping me take small bites and not have to big a serving. It certainly is a very pretty ice cream. 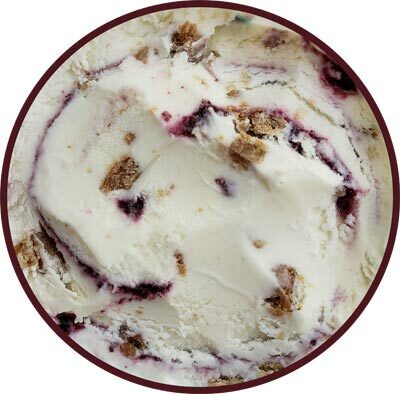 On Second Scoop: Blackberry: While the texture of the base ice cream is still a bit stiff, overall this is a pretty tasty ice cream as long as you get enough of the swirl and mix-ins on your spoon. It's not mind blowing, but it's fun. And yes, I still taste cream cheese and that's fine by me. I wind up just snacking on this one now and then rather than having a huge bowl of it. I can see buying this one on occasion because it is different enough to amuse me. 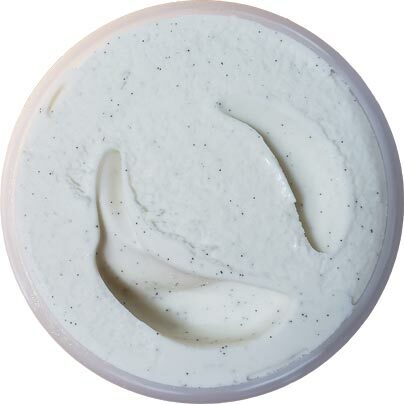 On Second Scoop: Vanilla: Bleck, just bleck. I scraped off the top to make sure I was getting a clean sample but I found myself really not liking this one. One bite told me that I wouldn't want to eat this even if I thought it was a good idea. It comes across gross to me (keeping in my that I don't like alcohol). If I was 100%, I would probably try to fake this one in to a shake just so I don't waste it, but I really don't like it. Maybe I can get my wife to try a little but I make no promises. Same thoughts on the vanilla. Just too strong or off from a more "traditional" vanilla. Tried the whoopie pie one. Was too dense or buttery and not enough whoopie pie pieces. Haven't been that impressed, probably wouldn't try another flavor. I was tempted to delete this last comment, but instead I will say: try elaborating and adding some evidence rather than general ranting with typos. Are you referring to the fact that he is at least one of the five different people laying claim to creating cookies & cream? He also claims to have invented dipped waffle cones. Also, he jumped on the idea of dairy-free "ice cream" very early on, apparently too early in fact as it appears DF Mavens has completely shut down. Oh well, the "godfather of ice cream" is probably retired and sitting on a beach somewhere now. Hi, just a note to say that Bourbon vanilla does not contain alcohol - the Bourbon name refers to the earlier name for Reunion Island, and is just another name for Madagascan vanilla (see https://en.wikipedia.org/wiki/Vanilla) so you can eat it with no worries - although from your comments about the above I don't think you would wish to anyway! I've been reading your blog for a few months now, and I really enjoy it, although as I'm based in the UK I don't get to try many of the ice creams mentioned - I'm just saving up ideas for my next visit to the US! Maybe you could visit Great Britain and try some of our ice creams - I could give you some recommendations! OMG! DF Mavens shut down?! I did not know that! They shut down without any announcements. I checked the social media pages and it vanished. I remember DF Mavens at the Green Festival Expo and when they were in NYC. They literally gave out free pints of ice cream! They really abruptly left and shuttered. I for one am glad you didnt delete the comment, it is short, it may not say much, b it isnt harmful in any way. Let people speak if they arent causing fights. I have tried Steves but cant remember it. I will try again if the price is better. @Aleksandr: yeah, I probably wasted half an hour trying to find some sign that they weren't toast. There store says it's returning but you don't delete all of your social media if you are coming back. They were tied to "desserts that matter" but they are gone to. I really feel like the the guy retired even though we are seeing more non-dairy options. Yup! They are toast! Right now I'm seeing more non-dairy offering in the stores and low calorie ice creams. Maybe they couldn't handle the competition which is a shame. I had their raspberry ice cream which was amazing. They will not be missed that much. Anon here (sorry I need an account linked). I have had trouble with some uhhh organic foodstores and specialty brands selling wihout Best By dates, sadly. I have found some of old Steves on sale (remember the salty smore i think), but also others on sale...that were expired by over a year. Wish these companies (Steves is pretty good) would have clear dates, some just have some gibberish lot number. They had these on sale at Price Chopper a couple weeks ago for $3 ea. I almost crapped myself and I bought like 12 pints lol. I thought they werent back yet, as some of the pints had an expiration date of september or october of this year. There was so much ice on them I was afraid to buy many the first time, but I was shocked at how much the ice and freezer burn didn't hurt the texture. Also, yes, I want to know more about this claim of "fraud". What makes you say that? 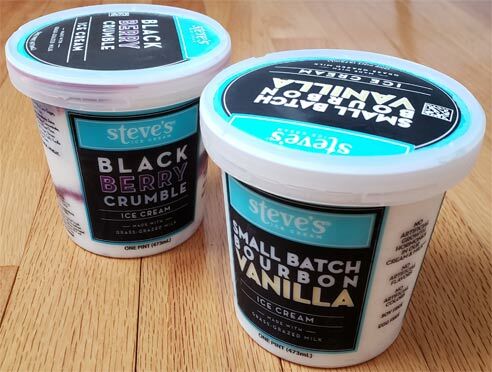 Being honest, Steve's was a bit junk and every flavor of theirs I tried was extremely bad. Not helping was their clear distributor problems in the northeast where cartons would be freezerburn or iced over. One of the things I have always liked about Steve's Ice Cream is that it doesn't have eggs in it. Eggs and I do not get along. I personally like the Bourbon Vanilla. I think it's a great twist on regular vanilla. I found only some of the dairy free the other day and I got excited to see it back. I, too, was surprised that they changed the container to the paper one instead of the plastic one. I don't eat dairy all that often, this ice cream is the only one I never had a bad reaction to. Probably due to both the eggs not in it and the grass fed cow milk. I need to do a post about it, but along with the switch to paper, they also have a few new flavors this year like Sicilian Chocolate Cannoli. It seems like they are in more stores this year too.